A political cartoon by Lebanese cartoonist Mahmoud Kahil criticizing the policies of Arial Sharon. Criticism of the Israeli government, often referred to simply as criticism of Israel, is an ongoing subject of journalistic and scholarly commentary and research within the scope of international relations theory, expressed in terms of political science. Within the scope of global aspirations for a community of nations, Israel has faced international criticism since its declaration of independence in 1948 relating to a variety of topics, both historical and contemporary. The government of Israel has been criticized for issues regarding Israeli settlements in the Palestinian territories, its treatment of Palestinian Arabs, the conduct of Israeli Defense Forces during conflicts and the blockade of the Gaza Strip, of Palestinian territories. Other historic issues with ongoing consequences have also been criticized including: the refusal to allow post-war Palestinian refugees to return to their homes, and the prolonged occupation of territories gained in war and the construction of settlements therein. Israel's status as a representative democracy has also been questioned because Israeli residents of the occupied territories are allowed to vote in Israel's elections while Palestinian residents are not. Another source of criticism is the friction generated by the conversion issue between Israel's Orthodox rabbinate and non-Orthodox segments of the Jewish diaspora. At one end of the spectrum are attempts to delegitimize Israel's right to exist. This has led to an ongoing debate regarding at what point criticism of Israel crosses the line to antisemitism. One of the effects of international criticism has been the impact on social psychology of the Israeli Jewish public - according to a survey more than half of Israelis believe "the whole world is against us", and three quarters of Israelis believe "that no matter what Israel does or how far it goes towards resolving the conflict with the Palestinians, the world will continue to criticize Israel". Criticisms of Israeli policies come from several groups: primarily from activists, within Israel and worldwide, the United Nations and other non-governmental organizations including European Churches, and mass media. Media bias is often claimed by both sides of the debate. Since 2003, the UN has issued 232 resolutions with respect to Israel, 40% of all resolutions issued by the UN over the period and more than six times that of the second placed country, Sudan. Palestinian refugees are defined by the UN as Arabs who lived in Palestine for at least two years prior to 1948 and their descendants, and who fled or were expelled from their homes during and after the 1948 Palestine War. "New Historian" Ilan Pappe argued in The Ethnic Cleansing of Palestine that Israel's policy between 1947 and 1949, when "over 400 Palestinian villages were deliberately destroyed, civilians were massacred, and around a million men, women, and children were expelled from their homes at gunpoint" is best described as ethnic cleansing. [page needed] However, Pappe's work has been subject to significant criticism and allegations of fabrication by other historians. For example, Israeli historian Benny Morris called Pappe "At best... one of the world’s sloppiest historians; at worst, one of the most dishonest." When asked about the 1948 Palestinian exodus from Lydda and Ramle, he responded "There are circumstances in history that justify ethnic cleansing. I know that this term is completely negative in the discourse of the 21st century, but when the choice is between ethnic cleansing and genocide - the annihilation of your people - I prefer ethnic cleansing. [...] There was no choice but to expel that population. It was necessary to cleanse the hinterland and cleanse the border areas and cleanse the main roads. It was necessary to cleanse the villages from which our convoys and our settlements were fired on." He also added in 2008, that "There was no Zionist "plan" or blanket policy of evicting the Arab population, or of "ethnic cleansing". Plan Dalet (Plan D), of 10 March 1948 ... was the master plan ... to counter the expected pan-Arab assault on the emergent Jewish state". The wars in 1956 and 1967 were waged by Israel to ensure the state's survival. As most hostilities were initiated by the Arab side, Israel had to fight and win these wars in order to ensure the state's sovereignty and safety. Territories captured in the course of those wars are therefore legitimately under Israeli administration for both security reasons and to deter hostile states from belligerence. The 1967 war was similarly caused by the closing of the Straits of Tiran, the rejection of UN forces in the Sinai desert, and the redeployment of Egyptian forces. Jordan and Syria entered the war in spite of Israeli efforts to keep these frontiers peaceful. The 1973 war was a surprise attack against Israel by Syria and Egypt. The 1956 war was a result of a conspiracy between France, the United Kingdom and Israel in violation of Egypt's sovereignty. Egypt claimed several legal justifications for refusing Israel use of the Suez Canal, including the right of self-defence. The war in 1967 was an unprovoked act of aggression aimed at expanding the boundaries of Israel, and the territories captured during this war are illegally occupied. As a result, the territories must be ceded in order for peace to be achieved. Israel's annexation of East Jerusalem and the Golan Heights in 1980-1 by the Jerusalem Law and the Golan Heights Law has not been recognised by any other country. The Palestinian Authority, the EU, and the UN Security Council consider East Jerusalem to be part of the West Bank, a position disputed by Israel. International bodies such as the United Nations have condemned the Jerusalem Law as a violation of the Fourth Geneva Convention and therefore hold that the establishment of the city as Israel's capital is against international law. Consequently, countries have established embassies to Israel's government outside of Jerusalem. Israel unilaterally disengaged from Gaza in September 2005, and declared itself no longer to be in occupation of the Strip. This has been contested by the UN, which though not declaring Gaza "occupied" under the legal definition, has referred to Gaza under the nomenclature of "Occupied Palestinian Territories". Some groups do assert that Gaza is legally occupied. Despite the fact that Israeli security legislation for Palestinian territories does not state that military law applies only to Arab residents of the territories, and not to Jews or to Israeli citizens. Israeli citizens are governed by Israeli law whereas Palestinians are governed by military law. The participating High Contracting Parties to the Fourth Geneva Convention, numerous UN resolutions, the International Court of Justice and other instances have ruled that Israel's policy of establishing civilian settlements in territories considered occupied, including in East Jerusalem, is illegal. Israel disputes the notion that the West Bank and in particular East Jerusalem are occupied under international law, though this view is dismissed internationally. Israel's settlement policy has drawn harsh criticism from the United States and the European Union. The international community criticized Israel for 'failing to protect the Palestinian population' from Israeli settler violence. Human Rights Watch (HRW) has said Israel operates a "two-tier" judicial system in areas of the occupied Palestinian territories it administers, to an effect which provides preferential services, development, and benefits for Israelis living in settlements in the occupied territories while imposing harsh conditions on Palestinians and other non-Israeli citizens. In some cases Israel has acknowledged differential treatment of Palestinians and Israelis, such as having separate roads for both communities and operating checkpoints for Palestinians, asserting that the measures are necessary to protect Israelis from attacks by Palestinian armed groups. In 2011 the Israeli parliament passed a law criminalizing participation in boycotts of Israeli settlements. The law drew criticism from the EU, the United States and the Anti-Defamation League. Amnesty International reported that in 2009 hundreds of Palestinians were detained and held incommunicado for extended periods of time by Israel. While most were later released without charge, hundreds were tried before military courts whose procedures often failed to meet international standards for fair trial. According to Amnesty, almost all Palestinian prisoners were held in violation of international humanitarian law, which prohibits the transfer of detainees to the territory of the occupying power (i.e., Israel proper). It claimed that about 300 minors and 550 adults were held without charge or trial for more than a year. In 2011, UN Secretary-General Ban Ki-Moon said Israel held thousands of Palestinians as prisoners, and called on Israel to release them. Ban said the release of political prisoners would "serve as a significant confidence-building measure" and boost prospects of peace in the region. Also Amnesty International has called on Israel to release political prisoners, saying "all political prisoners held without charge or trial should be tried in fair trials or immediately released". Israel objects to releasing prisoners, many of whom have been convicted by Israeli courts for violent crimes such as murder. However, several prisoner release deals have been conducted by Israel as a gesture in negotiations, many which involved the release of hundreds or more prisoners. According to Amnesty International, methods of torture used by Israel on Palestinian prisoners include prolonged tying in painful stress positions, sleep deprivation and threats to harm detainees’ families. Beatings and other ill-treatment of detainees are common during and following arrest and during transfer from one location to another. Organizations such as Amnesty International, the Association for Civil Rights in Israel (ACRI), the Israeli government-appointed Or Commission, and the United States Department of State have published reports that document racism and discrimination directed towards racial and ethnic groups in Israel. According to a study commissioned by Israel's Courts administration and Israel Bar Association, Arab Israelis who have been charged with certain types of crime are more likely than their Jewish counterparts to be convicted, and once convicted they are more likely to be sent to prison. The study also found differences in lengths of prison sentences given, with the average prison sentence at nine and a half months for Jews and 14 months for Arabs. Rights groups have said that anti-discrimination employment laws in Israel are rarely enforced. A coalition of nine Israeli rights groups has opposed a practice under which companies can advertise their policy to hire only Jewish Israelis, and no Arab Israelis. Companies advertising under a "Hebrew labor" banner adhere to a segregated employment philosophy derived from a practice by Jewish immigrants in Palestine in the first half of the 20th century which was meant to strengthen emerging Israeli industry from British and Arab influence. In February 2011, Netanyahu called German Chancellor Angela Merkel to complain about Germany's vote in favor of a resolution at the United Nations Security Council to declare Israeli settlements to be illegal and she responded "How dare you! You are the one who disappointed us. You haven't made a single step to advance peace." A few days later veteran Israeli diplomat Ilan Baruch resigned saying that Netanyahu's policies were leading to Israel's delegitimization. The IDF acknowledged using the "Neighbor Procedure” or the “Early Warning Procedure”, in which the IDF would encourage a Palestinian acquaintance of a wanted man to try to convince him to surrender. This practice was criticized by some as using "human shields", an allegation the IDF denied, saying that it never forced people into carrying out the Neighbor Procedure; and that Palestinians volunteered to prevent excess loss of life. Amnesty International and Human Rights Watch are among the groups who made the "human shield" comparison. The Israeli group B'Tselem also made the comparison, saying that "for a long period of time following the outbreak of the second intifada Operation Defensive Shield, in April 2002, the IDF systematically used Palestinian civilians as human shields, forcing them to carry out military actions which threatened their lives". The Neighbor Procedure was outlawed by the Supreme Court of Israel in 2005 but some groups say the IDF continues to use it, although they say the number of instances has dropped sharply. Israel has signed the Chemical Weapons Convention but not ratified it, citing neighbouring states that have not done so either. Israel is widely believed to have chemical weapons but officials have never directly admitted it, although in 1990 Science Minister Yuval Neeman threatened to retaliate against an Iraqi chemical-weapons strike "with the same merchandise". Israel has not signed the Biological Weapons Convention. Amnesty International has condemned Israel's policy of assassinations targeting individuals. Israeli officials have admitted that the policy exists and is being pursued, saying it helps prevent acts of terrorism from being committed against Israel. The United States has a very similar policy. Criticism against has been raised also from some on the Israeli left, who say assassination policy is "gangster behavior" unbecoming of a government and is against Israeli law. Israel's Supreme Court has ruled that assassinations are illegal, but leaked documents suggest that Israel's army has ignored the ruling. The term Judaization of Jerusalem refers to the view that Israel has sought to transform the physical and demographic landscape of Jerusalem to correspond with a vision of a united and fundamentally Jewish Jerusalem under Israeli sovereignty. The United Nations has criticised Israel's efforts to change the demographic makeup of Jerusalem in several resolutions. All legislative and administrative measures taken by Israel, which have altered or aimed to alter the character, legal status and demographic composition of Jerusalem, are described by the UN as "null and void" and having "no validity whatsoever". Richard Falk, an investigator with the U.N. Human Rights Council, said that Israel's expansion of East Jerusalem settlements and evictions of Palestinian residents can "only be described in its cumulative impact as a form of ethnic cleansing". In a 2008 report, John Dugard, independent investigator for the United Nations Human Rights Council, cites the Judaization of Jerusalem among many examples of Israeli policies "of colonialism, apartheid or occupation" that create a context in which Palestinian terrorism is "an inevitable consequence". Israel has enacted a Law of Return that allows Jews a fast-track to Israeli citizenship. Palestinian refugees cannot apply for Israeli citizenship under the law since they are not Jewish, though they can apply for Israeli citizenship through the conventional channel. The law has drawn criticism from the Cairo Institute for Human Rights Studies which says the law is a "main example of Israeli laws that discriminate against Palestinian Arabs". The American-Arab Anti-Discrimination Committee says the contrast between the Law of Return and Israeli opposition to the right of return of Palestinian refugees exhibits "barefaced racism". More than 1,000 American Jews have backed a campaign entitled “Breaking the Law of Return”, saying the Law of Return creates an ethnically exclusive citizenship, which they see as unjust. Critics claim that the guaranteed right for Jews to immigrate to Israel is discriminatory to non-Jews and therefore runs counter to the democratic value of equality under the law. The UN has issued 232 resolutions with respect to Israel since 2003, representing 40% of all resolutions issued by the UN over the period and more than six times that of the second placed country, Sudan. According to testimony by the pro-Israel human rights NGO UN Watch to the United States Congress in January 2011 with respect to the United Nations Human Rights Council, Israel has been the focus of 70% of approximately 50 condemnatory resolutions by the council, 60% of the ten Special Sessions of the council and 100% of the council's five fact-finding missions or inquiries. Comparisons between apartheid South Africa and Israel are increasingly made. Israelis recoil at the analogy, but the parallel is widely drawn in international circles. The Association for Civil Rights in Israel, a group in Israel with support from several EU states, asserted in 2008 that the separate road networks in the West Bank for Israelis and Palestinians, the expansion of Jewish settlements, restriction of the growth of Palestinian towns and discriminatory granting of services, budgets and access to natural resources are "a blatant violation of the principle of equality and in many ways reminiscent of the Apartheid regime in South Africa". Israel has also been accused of apartheid by Michael Ben-Yair, Israel's attorney-general from 1993 to 1996. and Shulamit Aloni, who served as Minister for Education under Yitzhak Rabin. Some key aspects of Israeli society are sometimes compared to Nazi Germany, directly or by allusion. Examples include: equating the Gaza Strip with concentration camps in Nazi-occupied Europe,[better source needed] Ariel Sharon with Joseph Goebbels,[better source needed] and equating the idea of Jews as the chosen people with Nazi idea of the Master Race. The IHRA Working Definition on Antisemitism consider such comparisons as antisemitic. Following the 1967 Six-Day War, the Soviet Union compared Israeli tactics to those of Nazi Germany. A similar comparison was made by the Israeli Arab author Nimer Nimer. Yeshayahu Leibowitz, one of Israel's most prominent and acclaimed public intellectuals, philosophers, and scientist, and an Orthodox Jew, warned in 1982 that if the occupation continued, Israel would be in danger of succumbing to “Judeo-Nazism". In 1984, author Israel Stockman-Shomron noted Nazi allusions in articles critical of Israel in publications including The Christian Science Monitor, The Washington Post and The New York Times. In 2000, Nur Masalha characterized Israel's occupation of Palestine territories as comparable to the Nazi Lebensraum (living space) policy of gaining land and materials for the benefit of Germans. In 2002, Portuguese Nobel Prize-winning author Jose Saramago compared conditions in Ramallah to concentration camps and, in conversation with a journalist, commented that the gas-chambers would "be here before long". In 2004, writer Josie Sandercock described Gaza as the "largest concentration camp in the world". In 2005, Chilean author Luis Sepulveda wrote: "In Auschwitz and Mauthausen, in Sabra, Shatila, and Gaza, Zionism and Nazism go hand in hand". In 2006, Arab journalist Jihad al-Khazin wrote an article in Al-Hayat comparing Ehud Olmert to Hitler. In 2009, British Member of Parliament Gerald Kaufman suggested that an Israeli justification for the deaths of 1,000 Palestinians on the grounds that "500 of them were militants" represented "the reply of a Nazi", and that the same logic could have been applied in the Warsaw Ghetto. In 2009, Professor William I. Robinson was accused by the Anti-Defamation League of anti-Semitism and misconduct because his classroom materials included a visual image comparison of the Israeli attacks on Gaza to the Warsaw Ghetto. Scholars for Peace in the Middle East supported Robinson, citing academic freedom. In 2009 and 2010, two United Nations special rapporteurs, Richard Falk and Jean Ziegler, were criticised by pro-Israel commentators for making comparisons between policies of the Israeli government and those of Nazi Germany. In 2010, Israeli professor Gavriel Salomon protested against Israeli loyalty-oath legislation, and compared Israel to Nazi Germany, adding: "I am not talking about the death camps, but about the year 1935. There were no camps yet but there were racist laws. And we are heading forward towards these kinds of laws." In 2013, musician Roger Waters said in an American online interview, "The parallels with what went on in the 1930s in Germany are so crushingly obvious." In 2015, during an interview on Kol Yisrael, Dr. Ofer Cassif, a political science lecturer at the Hebrew University of Jerusalem, said: "I think it's fair to compare Israel to Germany in the 1930s, and not to the years of genocide... we have moved into a completely different phase in the history of this country. We are now the Germany of the 1930s." In 2018, after the Nation-State Law was passed, President of Turkey Recep Tayyip Erdoğan said the "spirit of Hitler" lives on in Israel. He said the law is designed to strengthen Israel's identity as the "national home of the Jewish people" which showed that the soul of the Nazi leader had "risen again within some of Israel's officials". He added: "There's no difference between Hitler's obsession with a pure race and the understanding that these ancient lands are just for the Jews." Hajo Meyer, physicist and Jewish Holocaust survivor from Auschwitz, spent the final years of his life comparing Israel's treatment of Palestinians to the Nazis in Germany. In May 2018, Jewish Voice for Labour and Free Speech on Israel produced a definition of antisemitism. In notes posted on the Jewish Voice for Labour website they argued that comparing Israel's actions to those of the Nazis should not automatically be seen as antisemitic: "Drawing such parallels can undoubtedly cause offence, but potent historical events and experiences are always key reference points in political debate. Whether such comparisons are anti-Semitic must be judged on their substantive content, and on the inferences that can reasonably be drawn about the motivation for making them, rather than on the likely degree of offence caused." In September, JVL contributed to the consultation on Labour's new code of conduct rejecting suggestions that comparisons between Israel and "features of pre-war Nazi Germany" or apartheid-era South Africa were "inherently antisemitic", and that "Such comparisons are only anti-Semitic if they show prejudice, hostility or hatred against Jews as Jews." "In the course of this narrative, I have voiced criticisms of the actions of various governments, notably those of Britain, the United States, France, the Arab countries and Israel... Criticism of the Israeli government does, however, require a particular explanation. A number of people, both Jews and Gentiles, are apt to refer to any criticism of Israeli policy as "offensive anti-Semitism", an accusation implying a definite moral lapse. An early example of the perception of a connection between Criticism of the Israeli government and alleged antisemitism: Glubb Pasha, A Soldier with the Arabs, in the preface to his 1956 memoirs. Some criticisms of Israel or Israeli policies have been characterized as anti-Semitic. Proponents of the concept of New Antisemitism, such as Phyllis Chesler, Gabriel Schoenfeld and Mortimer Zuckerman, argue that, since the 1967 Six-Day War, many criticisms of Israel are veiled attacks on Jews and hence are essentially antisemitic. Abba Eban, Robert S. Wistrich, and Joschka Fischer focus on criticism of Zionism, and contend that some forms of anti-Zionism, particularly attacks on Israel's right to exist, are anti-Semitic in nature. Critics of this view often portray this view as an "equation" of criticism with anti-Semitism. Some critics of Israel or Israeli policies, including Ralph Nader, Jenny Tonge, Noam Chomsky, and Desmond Tutu suggest that equating criticism of Israel with antisemitism is inappropriate or inaccurate. Other critics, such as John Mearsheimer, Alexander Cockburn, Norman Finkelstein, and William I. Robinson, claim that supporters of Israel sometimes equate criticism of Israel with anti-Semitism in a deliberate attempt to prevent legitimate criticism of Israel and discredit critics. However, proponents of the view usually argue that the equation of criticism with antisemitism is rarely made. For example, Alvin H. Rosenfeld considers this argument to be disingenuous, dismissing it as "the ubiquitous rubric 'criticism of Israel,'" He states that "vigorous discussion of Israeli policy and actions is not in question," but rather statements that go well beyond legitimate criticism "and call into question Israel's right to continued existence." Alan Dershowitz claims that some enemies of Israel pretend to be victimized by accusations of anti-Semitism, in order to garner support for their position. The European Monitoring Centre on Racism and Xenophobia (EUMC) prepared a report in 2003 that distinguished criticism of Israel from anti-Semitism by testing whether "Israel is seen as being a representative of 'the Jew'": if the speaker is considering Israel as a representative of Jews in general, then anti-Semitism is deemed to be underlying the criticism. Demonization - when Israeli actions are blown so far out of proportion that the account paints Israel as the embodiment of all evil. Double Standards - when Israel is criticized soundly for an action or policy that any other government would be viewed as justified in doing, like protecting its citizens from terrorism. Delegitimization: a denial of Israel's right to exist or the right of the Jewish people to live securely in a homeland. Demonization and double standards are often used as evidence of anti-Semitism in relation to criticism of Israel. Sharansky believes that some criticisms involve applying an especially high moral standard to Israel, higher than applied to other countries (particularly compared to surrounding countries), yet the only special characteristic of Israel is that it is a Jewish state, hence there is an element of anti-Semitism. Delegitimization was a factor addressed by Abba Eban, who claimed that efforts to deny "the equal rights of the Jewish people its lawful sovereignty within the community of nations" constituted anti-Semitism. This part of the definition has proved highly contentious and is seen by many as attempting to proscribe legitimate criticism of the human rights record of the Israeli Government by attempting to bring any criticism of Israel into the category of antisemitism, and as not sufficiently distinguishing between criticism of Israeli actions and criticism of Zionism as a political ideology, on the one hand, and racially based violence towards, discrimination against, or abuse of, Jews. Paul Igansky points out that one of the EUMC anti-Semitic behaviors, comparisons between Israeli policy and those of the Nazis, is "arguably not intrinsically antisemitic", and that the context in which they are made is critical. Igansky illustrates this with the incident where Israeli prime minister Yitzhak Rabin was described by fellow Jewish Israelis as cooperating with the Nazis, and depicted wearing an SS uniform. According to Igansky, the "Nazi" label was merely used as "charged political rhetoric" in this case. Following the 2006 EUMC report, the European Institute for the Study of Contemporary Antisemitism (EISCA) published a report in 2009 entitled Understanding and Addressing the ‘Nazi Card' - Intervening Against Antisemitic Discourse which discussed comparisons of Israel with Nazi Germany. The 2009 report incorporated from the 2006 report the five specific kinds of criticism of Israel that should be considered as anti-Semitism (see above for a list of the five). The report does not say all criticism of Israel is anti-Semitic: "Abhorrence and protest against the policies, practices, and leaders of the Israeli state can be expressed in numerous forceful and trenchant ways, as they could against any other state - none of which would be antisemitic…", and "Drawing attention to the consequent harms in [playing the Nazi card against Israel] should not be intended, or taken, in any way as an attempt to suppress criticism of Israel and its military practices." Antony Lerman criticized the report, and suggested that it could be used to suppress legitimate criticism of Israel, and suggests that the report's authors do not adequately address that possibility. Some commentators have objected to the characterization of criticisms of Israel as anti-Semitic, and have often asserted that supporters of Israel equate criticism with anti-Semitism or excessively blur the distinction between the two. Examples include Michael P. Prior, Noam Chomsky, Norman Finkelstein, Michael Lerner, Antony Lerman, Ralph Nader, Jenny Tonge, Ken Livingstone, and Desmond Tutu. They provide a variety of reasons for their objections, including stifling free expression, promoting anti-Semitism, diluting genuine anti-Semitism, and alienating Jews from Judaism or Israel. Michael Lerner claims that the American Jewish community regularly tries to blur the distinction between legitimate criticism of Israel and anti-Semitism, and says it is a "slippery slope" to expand the definition of anti-Semitism to include legitimate criticism of Israel. Philosophy professor Irfan Khawaja asserts that it is a "false equation" to equate anti-Zionism with anti-Semitism, writing "The point is not that the charge of 'anti-Semitism' should never be made: some people deserve it…. But the equation of anti-Semitism with anti-Zionism is a farce that has gone on long enough, and it’s time that those who saw through the farce said so…"
Palestine Monitor, a Palestinian advocacy group, is critical of what it characterizes as a modern trend to expand the definition of the term "antisemitic", and states that the new definitions are overly vague and allow for "indiscriminate accusations". Brian Klug argues that anti-Zionism sometimes is a manifestation of antisemitism, but that "[t]hey are separate" and that to equate them is to incorrectly "conflate the Jewish state with the Jewish people." Irfan Khawaja suggests that some legitimate criticisms of Israel are improperly attacked by deliberately conflating them with criticisms that are anti-Semitic in nature. Alexander Cockburn and Jeffrey St. Clair, in the book The Politics of Anti-Semitism, write "Apologists for Israel's repression of Palestinians toss the word 'anti-Semite' at any critic of what Zionism has meant in practice for Palestinians on the receiving end. So some of the essays in this book address the issue of what constitutes genuine anti-Semitism – Jew-hatred – as opposed to disingenuous, specious charges of 'anti-Semitism' hurled at rational appraisals of the state of Israel's political, military, and social conduct." Sander Gilman has written, "One of the most recent forms of Jewish self-hatred is the virulent opposition to the existence of the State of Israel." He uses the term not against those who criticize Israel's policy, but against Jews who oppose Israel's existence. Michael Lerner, editor of Tikkun magazine, asserts that the equation of Criticism of Israel with anti-Semitism has resulted in conflict within the Jewish community, in particular, proponents of the equation sometimes attack Jewish critics of Israeli policies as "self-hating Jews". Lerner also claims that the equation of Criticism of Israel with anti-Semitism and the resulting charges of "self hating Jew" has resulted in the alienation of young Jews from their faith. Antony Lerman believes that many attacks on Jewish critics of Israel are "vitriolic, ad hominem and indiscriminate" and claims that anti-Zionism and anti-Semitism have been defined too broadly and without reason. Lerman also states that the "redefinition" of anti-Semitism to include anti-Zionism has caused Jews to attack other Jews, because many Jews are leaders in several anti-Zionist organizations. Nicholas Saphir, Chair of the Board of Trustees of the New Israel Fund in the UK published an open letter defending non-governmental organizations (NGOs) that operate within Israel to promote civil rights. He said that several organisations such as NGO Monitor, Israel Resource News Agency, WorldNetDaily and the Near and Middle East Policy Review "associate moral and ethical criticism of any activity by Israel or the policies of its Government as being anti-Israel, anti-Semitic and when conducted by Jews, as evidence of self-hatred." The International Jewish Anti-Zionist Network is also opposed to the use of the antisemitic label to suppress criticism, and objected to the "fear tactics" employed when the anti-Semitic label was applied to supporters of Israel Apartheid Week, claiming that it was reminiscent of the anti-Communist scare tactics of the 1950s. Michael Lerner suggests that some United States politicians are reluctant to criticise Israel because they are afraid of being labelled anti-Semitic. Lerner also states that groups that promote peace in the mid-East are afraid to form coalitions, lest they be discredited by what Lerner terms the "Jewish Establishment". Brian Klug asserts that proponents of New Antisemitism define antisemitism so broadly that they deprive the term "antisemitism" of all meaning. Klug writes: "... when anti-Semitism is everywhere, it is nowhere. And when every anti-Zionist is an anti-Semite, we no longer know how to recognize the real thing--the concept of anti-Semitism loses its significance." In the book The Politics of Anti-Semitism Scott Handleman writes: "Partisans of Israel often make false accusations of anti-Semitism to silence Israel's critics. The 'antisemite' libel is harmful not only because it censors debate about Israel's racism and human rights abuses but because it trivializes the ugly history of Jew-hatred." Brian Klug argues that excessive claims of anti-Semitism (leveled at critics of Israel) may backfire and contribute to anti-Semitism, and he writes "a McCarthyite tendency to see anti-Semites under every bed, arguably contributes to the climate of hostility toward Jews"
Tony Judt also suggests that Israel's "insistent identification" of criticism of Israel with anti-Semitism is now the leading source of anti-Jewish sentiment in the world. Michael Lerner echos those thoughts and suggests that the continued "repression" of criticism of Israel may eventually "explode" in an outburst of genuine anti-Semitism. Michael Lerner claims that some supporters of Israel refuse to discuss legitimate criticisms of Israel (such as comparisons with apartheid) and instead attack the people who raise such criticisms, thus deliberately "shifting the discourse to the legitimacy of the messenger and thus avoiding the substance of the criticisms". Alan Dershowitz distinguishes between legitimate criticism of Israel and anti-Semitism, but he claims that some "enemies of Israel" encourage the equation of the two, because it makes the enemies appear to be victims of false accusations of anti-Semitism, which the enemies use in an attempt to gain sympathy for their cause. "I do not subscribe to the myths propagated by enemies of Israel and I am not blaming Jews for anti-Semitism. Anti-Semitism predates the birth of Israel. Neither Israel's policies nor the critics of those policies should be held responsible for anti-Semitism. At the same time, I do believe that attitudes toward Israel are influenced by Israel's policies, and attitudes toward the Jewish community are influenced by the pro-Israel lobby's success in suppressing divergent views." On the other hand, in his book, The Deadliest Lies, Abraham Foxman referred to the notion that the pro-Israel lobby is trying to censor criticism of Israel as a "canard. "[page needed] Foxman writes that the Jewish community is capable of telling the difference between legitimate criticism of Israel "and the demonization, delegitimization, and double standards employed against Israel that is either inherently anti-Semitic or generates an environment of anti-Semitism. "[page needed] Jonathan Rosenblum expressed similar thoughts: "Indeed, if there were an Israel lobby, and labeling all criticism of Israel as anti-Semitic were its tactic, the steady drumbeat of criticism of Israel on elite campuses and in the elite press would be the clearest proof of its inefficacy." Alan Dershowitz wrote that he welcomes "reasoned, contextual and comparative criticism of Israeli policies and actions." If one of the goals of the pro-Israel lobby was to censor criticism of Israel, Dershowitz writes, "it would prove that 'the Lobby' is a lot less powerful than the authors would have us believe." Several commentators have asserted that supporters of Israel attempt to stifle legitimate criticism of Israel by unfairly labeling critics as antisemitic. One of the major themes of Norman Finkelstein's book Beyond Chutzpah: On the Misuse of Anti-Semitism and the Abuse of History is that some supporters of Israel employ accusations of anti-Semitism to attack critics of Israel, with the goal of discrediting the critics and silencing the criticism. [page needed] Professors Judy Rebick and Alan Sears, in response to Israel Apartheid Week activities at Carleton University, wrote an open letter to the University president which claimed that accusations of anti-Semitism are sometimes made with the goal of "silencing" criticism of Israel. Journalist Peter Beaumont also claims that some proponents of the concept of New Antisemitism conflate criticism of Israel with anti-Semitism. Tariq Ali, a British-Pakistani historian and political activist, argues that the concept of new antisemitism amounts to an attempt to subvert the language in the interests of the State of Israel. He writes that the campaign against "the supposed new 'anti-semitism'" in modern Europe is a "cynical ploy on the part of the Israeli Government to seal off the Zionist state from any criticism of its regular and consistent brutality against the Palestinians.... Criticism of Israel can not and should not be equated with anti-semitism." He argues that most pro-Palestinian, anti-Zionist groups that emerged after the Six-Day War were careful to observe the distinction between anti-Zionism and antisemitism. Jewish Voice for Peace has spoken against what they see as the abuse of the antisemitic label. For example, in an opinion piece, they wrote "For decades, some leaders of the Jewish community have made the preposterous claim that there is complete unity of belief and interest between all Jews and the Israeli government, no matter what its policies. They must believe their own propaganda, because they see no difference between criticism of the Israeli government and anti-Semitism, and they do everything they can to silence critical voices. If the brand of anti-Semitism is not sufficiently intimidating, the silencing has been enforced by organized phone and letter-writing campaigns, boycotts, threats of, and actual withdrawal of funding support from 'offending' institutions and individuals." John Mearsheimer and Stephen Walt claim that the accusations of anti-Semitism leveled at critics of Israel are deliberately timed to defuse the impact of the criticisms. They suggest a pattern where accusations of antisemitism rise immediately following aggressive actions by Israel: following the Six-Day War, following the 1982 Lebanon War, and following exposure of "brutal behavior in the Occupied Territories" in 2002. Norman Finkelstein says that to further a public relations campaign, apologists for Israel make accusations of what they call a "new anti-Semitism" against those they oppose, and that they do so deliberately in order to undermine critics and bolster the nation's image. Finkelstein also asserts that "American Jewish organizations" purposefully increase vocal accusations of anti-Semitism during episodes when Israel is coming under increased criticism (such as the during the Intifada), with the goal of discrediting critics of Israel. Critics of Israel who have been accused of antisemitism and have denied the allegation include Ralph Nader, John Mearsheimer, Cindy Sheehan, Jenny Tonge, Ken Livingstone, Desmond Tutu, and Helen Thomas. Professor J. Lorand Matory is a vocal critic of Israel who supports disinvestment from Israel. Larry Summers, president of Harvard, called efforts by Matory and others to divest from Israel "anti-Semitic in effect, if not intent." According to Matory, "the knee jerk accusation that targeted criticism of Israel singles out Israel is as absurd as stating that the anti-apartheid movement was singling out South Africa." Professor Noam Chomsky argues that Israel's foreign minister Abba Eban equated anti-Zionism with anti-Semitism in an effort to "exploit anti-racist sentiment for political ends", citing statement Eban made in 1973: "One of the chief tasks of any dialogue with the Gentile world is to prove that the distinction between anti-Semitism and anti-Zionism is not a distinction at all." Commenting on Eban's statement, Chomsky replied: "That is a convenient stand. It cuts off a mere 100 percent of critical comment!" In 2002, Chomsky wrote that this equation of anti-Zionism with anti-Semitism was being extended to criticism of Israeli policies, not just criticism of Zionism. Chomsky also wrote that, when the critics of Israel are Jewish, the accusations of anti-Semitism involve descriptions of self-hatred. In 2004, Chomsky said "If you identify the country, the people, the culture with the rulers, accept the totalitarian doctrine, then yeah, it's anti-Semitic to criticize the Israeli policy, and anti-American to criticize the American policy, and it was anti-Soviet when the dissidents criticized Russian policy. You have to accept deeply totalitarian assumptions not to laugh at this." However, Oliver Kamm contends that Chomsky inaccurately interpreted Eban's comments. Musician Roger Waters is a critic of Israel's treatment of Palestinians, and was accused by the ADL of using anti-Semitic imagery in one of his recent musical productions. Waters responded by stating that the ADL regularly portrays critics of Israel as anti-Semitic, and that "it is a screen they [the ADL] hide behind". 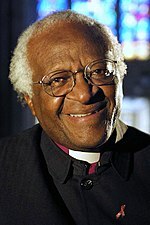 In 2002 Desmond Tutu is a critic of Israel who has compared Israel's policies to apartheid South Africa. Tutu wrote that criticism of Israel is suppressed in the United States, and that criticisms of Israel are "immediately dubbed anti-Semitic". Michael Prior was a vocal critic of Israel's treatment of Palestinians, and who was frequently accused of anti-Semitism, yet he was careful to distinguish between anti-Zionism and anti-Semitism. Ken Livingstone, former mayor of the City of London, was accused of antisemitism for a variety of comments, including remarks criticizing Israel's treatment of Palestinians. In response, Livingstone wrote "For 20 years Israeli governments have attempted to portray anyone who forcefully criticizes the policies of Israel as anti-semitic. The truth is the opposite: the same universal human values that recognize the Holocaust as the greatest racist crime of the 20th century require condemnation of the policies of successive Israeli governments - not on the absurd grounds that they are Nazi or equivalent to the Holocaust, but because ethnic cleansing, discrimination and terror are immoral." Peace activist Cindy Sheehan claims she has been improperly accused of being anti-Semitic because of her anti-war position, particularly her criticism of the Israel lobby and Israel's actions towards Palestinians. Sheehan emphasized that her criticism of Israel is "not to be construed as hatred of all Jews". Political scientists John Mearsheimer and Stephen Walt wrote an article critical of the Israel lobby in the United States, in which they asserted that the Israel lobby uses accusations of anti-Semitism as a part of a deliberate strategy to suppress criticism of Israel. Mearsheimer and Walt themselves were accused of anti-Semitism as a result of that article and the book they wrote based on the article. Jenny Tonge, member of the UK House of Lords, has frequently criticized Israel's policies, and has been labelled antisemitic. In response, she said during a speech in Parliament: "I'm beginning to understand ... the vindictive actions the Israel lobby [and] AIPAC ... take against people who oppose and criticize the lobby.... [I understand] ... the constant accusations of antisemitism - when no such sentiment exists - to silence Israel's critics." Ralph Nader, United States politician and consumer advocate, has criticized Israel's policies, expressed support for Palestinian causes, and criticized the excessive influence of the Israel lobby on the U. S. government. In response, Nader wrote a letter to the director of the Anti-Defamation League entitled "Criticizing Israel is Not Anti-Semitism" in which he said "Your mode of operation for years has been to make charges of racism or insinuation of racism designed to slander and evade. Because your pattern of making such charges, carefully calibrated for the occasion but of the same stigmatizing intent, has served to deter critical freedom of speech.... The ADL should be working toward this objective [peace] and not trying to suppress realistic discourse on the subject with epithets and innuendos." Dr. Steven Salaita, an American expert on comparative literature and post-colonialism, became embroiled in a controversy regarding freedom of speech for faculty at American universities when his offer of employment was withdrawn from UIUC by Chancellor Dr. Phyllis Wise, a move some regard as an infringement on Salaita's freedom of speech. During the 2014 conflict between Israel and Gaza, he had published tweets that were seen as criticism of the Israeli government, and Salaita claims that as a result, pro-Israel advocates associated with the university accused him of anti-Semitism and pressured the university to rescind its offer of employment to him. As a result of his outspoken critique of the university's handling of his situation, Haaretz notes that Salaita has established "celebrity status on the lecture circuit." In November 2015, Salaita and UIUC reached a settlement which included a payment of $600,000 to Salaita and covering his attorney's costs; the university did not admit any wrongdoing. Mudar Zahran, a Jordanian of Palestinian heritage, writes that the "tendency to blame Israel for everything" has provided Arab leaders an excuse to deliberately ignore the human rights of the Palestinian in their countries. As an example, he said that while the world is furious over the blockade on Gaza, the media choose to deliberately ignore the conditions of the Palestinians living in refugee camps in Lebanon and other Arab countries. George Will claims that the "blame Israel first (and last, and in between) brigade" is "large and growing". Ministry of Foreign Affairs (Israel) has encouraged the use of social media to counteract criticism of Israel's policies. One member of the diplomatic corps proposed more aggressive action regarding Israel's critics. In June 2012, Israel's Channel 10 published an e-mail in which Nurit Tinari-Modai, deputy head of Israel's mission in Ireland and wife of the ambassador, Boaz Moda'i, proposed harassing expatriate Israelis who criticized Israeli policies, posting photos of them and publishing disinformation that would embarrass them. She claimed that they were critical of Israel because of their sexual identity. Following the publicity about Tinari-Modai's tactics, the Foreign Ministry quickly distanced itself from her letter. Her recommendation included the following :"You have to try and hit their soft underbellies, to publish their photographs, maybe that will cause embarrassment from their friends in Israel and their family, hoping that local activists would understand that they may actually be working on behalf of Mossad." International criticism is an important focus within Israel. According to an August 2010 survey by Tel Aviv University, more than half of Israelis believe "the whole world is against us", and three quarters of Israelis believe "that no matter what Israel does or how far it goes towards resolving the conflict with the Palestinians, the world will continue to criticize Israel". As a result, public diplomacy has been an important focus of Israeli governments since Independence. The Israeli Ministry of Public Diplomacy & Diaspora Affairs seeks to explain government policies and promote Israel in the face of what they consider negative press about Israel around the world. The EISCA Report recommends that the British government criminalize certain kinds of anti-Semitism, particularly use of the Nazi analogy to criticize Israel, as well as other forms of criticism of Israel. Paul Craig Roberts and Antony Lerman have questioned the recommendations of the EISCA report, expressing concerns that the recommendations of the report may be adopted as a hate-crime law within Europe, which may lead to infringement of free speech, and may criminalize legitimate criticism of Israel. Author Paul Craig Roberts is opposed to legislation in the United States will make it a crime to criticize Israel, and as examples he cites the Global Anti-Semitism Review Act of 2004 and the Hate Crimes Prevention Act of 2009. Roberts asserts that lobbyists for Israel are pressing for laws that will make it a crime to discuss the power of the Israel lobby, or to discuss alleged war crimes of Israel. Antony Lerman criticized the 2009 EISCA report, and claims that criminalizing criticism of Israel (particularly, comparing Israel actions to Nazi actions) would constitute an excessive infringement of freedom of speech in Britain, postulating, for example, that "if you said 'the way the IDF operated in Gaza was like the way the SS acted in Poland', and a Jew found this offensive, hurtful or harmful, you could, in theory, go to jail." Boycotts of Israel are economic and political cultural campaigns or actions that seek a selective or total cutting of ties with the State of Israel. Such campaigns are employed by those who challenge the legitimacy of Israel, Israel's policies or actions towards the Palestinians over the course of the Arab–Israeli and Israeli–Palestinian conflict, oppose Israeli territorial claims in the West Bank or Jerusalem or even oppose Israel's right to exist. Arab boycotts of Zionist institutions and Jewish businesses began before Israel's founding as a state. An official boycott was adopted by the Arab League almost immediately after the formation of the state of Israel in 1948, but is not fully implemented in practice. Similar boycotts have been proposed outside the Arab world and the Muslim world. These boycotts comprise economic measures such as divestment; a consumer boycott of Israeli products or businesses that operate in Israel; a proposed academic boycott of Israeli universities and scholars; and a proposed boycott of Israeli cultural institutions or Israeli sport venues. Many advocates of the Boycott, Divestment and Sanctions (BDS) campaign, including Archbishop Desmond Tutu use the 1980s movement against South African apartheid as a model. Disinvestment from Israel is a campaign conducted by religious and political entities which aims to use disinvestment to pressure the government of Israel to put "an end to the Israeli occupation of Palestinian territories captured during the 1967 military campaign." The disinvestment campaign is related to other economic and political boycotts of Israel. A notable campaign was initiated in 2002 and endorsed by South African bishop Desmond Tutu. Tutu said that the campaign against Israel's occupation of the Palestinian territories and its continued settlement expansion should be modeled on the successful, but controversial, disinvestment campaign previously imposed against South Africa's apartheid system. Cockburn, Alexander (2003). The Politics of Anti-Semitism. AK Press. ISBN 1-902593-77-4. EISCA Report - by Igansky, Paul, and Sweiry, Abe, Understanding and Addressing the ‘Nazi Card' - Intervening Against Antisemitic Discourse, published by European Institute for the Study of Contemporary Antisemitism (EISCA), 2009, online. EUMC report - Antisemitism - Summary overview of the situation in the European Union 2001-2005 - Working Paper, Beate Winkler, European Monitoring Centre on Racism and Xenophobia (EUMC), May 2006, online. Finkelstein, Norman G. (2005). Beyond Chutzpah: On the Misuse of Anti-Semitism and the Abuse of History. University of California Press. ISBN 0-520-24598-9. Igansky, Paul, and Sweiry, Abe, Understanding and Addressing the ‘Nazi Card' - Intervening Against Antisemitic Discourse, published by European Institute for the Study of Contemporary Antisemitism (EISCA), 2009, online. Cited as "EISCA Report" (see above). Judt, Tony, "The Country That Wouldn't Grow Up", int Haaretz, 2 May 2006, online. Klug, Brian, "The Myth of the New Anti-Semitism", in The Nation, posted January 15, 2004 (February 2, 2004 issue), online, accessed January 9, 2006. Klug, Brian (March 2005). "Is Europe a lost cause? The European debate on antisemitism and the Middle East conflict". Patterns of Prejudice. 39 (1): 46–59. doi:10.1080/00313220500045253. Retrieved 24 July 2010. Lerner, Michael. There Is No New Anti-Semitism, posted February 5, 2007, accessed February 6, 2007. Alvin H. Rosenfeld. 'Progressive' Jewish Thought and the New Anti-Semitism. American Jewish Committee. 2006. Wistrich, Robert S. (Fall 2004). "Anti-Zionism and Anti-Semitism". Jewish Political Studies Review. 16 (3–4). Retrieved 2007-02-26. ^ Dershowitz, Alan (2004). The Case for Israel. p. 1. The Jewish nation of Israel stands accused in the dock of international justice. The charges include being a criminal state, the prime violator of human rights, the mirror image of Nazism, and the most intransigent barrier to peace in the Middle East. Throughout the world, from the chambers of the United Nations to the campuses of universities, Israel is singled out for condemnation, divestment, boycott and demonization. ^ Dershowitz, Alan (2009). The Case Against Israel's Enemies: Exposing Jimmy Carter and Others Who Stand in the Way of Peace. pp. 1–2. For a tiny nation of little more than six and a half million citizens living in an area roughly the size of New Jersey, Israel has proportionally more enemies than any nation on earth. No nation has been threatened more often with divestment, boycotts, and other sanctions. No nation has generated more protests against it on college and university campuses. No nation has been targeted for as much editorial abuse from the worldwide media. No nation has been subjected to more frequent threats of annihilation. No nation has had more genocidal incitements directed against its citizens. It is remarkable indeed that a democratic nation born in response to a decision of the United Nations should still not be accepted by so many countries, groups, and individuals. No other UN member is threatened with physical destruction by other member states so openly and with so little rebuke from the General Assembly or the Security Council. Indeed, no nation, regardless of its size or the number of deaths it has caused, has been condemned as often by the UN and its constituent bodies. Simply put, no nation is hated as much as the Jewish nation. ^ a b Hagee, John (2007). In Defense of Israel. p. 1. You look toward the United Nations, which Ambassador Dore Gold calls 'the Tower of Babble'. You look at Europe, where the ghost of Hitler is again walking across the stage of history. You open your newspapers and read about American universities, where Israel is being vilified by students taught by professors whose Middle Eastern chairs are sponsored by Saudi Arabia. You look to America's mainline churches and see their initiatives to divest from Israel. You go to the bookstore and see slanderous titles by the former president of the United States - and you feel very much alone. ^ "Domain Names and Web Hosting by IPOWER". Globalpolitician.com. Retrieved 2014-08-18. ^ Watt, Nicholas; Sherwood, Harriet (27 July 2010). "David Cameron: Israeli blockade has turned Gaza Strip into a 'prison camp'". The Guardian. London. ^ a b BARAT, FRANK. "Why Israel is Not a Democracy". Retrieved 15 September 2014. Ilan Pappé: No, Israel is definitely not a democracy. A country that occupies another people for more than 40 years and disallow them the most elementary civic and human rights cannot be a democracy. A country that pursues a discriminatory policy against a fifth of its Palestinian citizens inside the 67 borders cannot be a democracy. In fact Israel is, what we use to call in political science a Herrenvolk democracy, its democracy only for the masters. The fact that you allow people to participate in the formal side of democracy, namely to vote or to be elected, is useless and meaningless if you don’t give them any share in the common good or in the common resources of the State, or if you discriminate against them despite the fact that you allow them to participate in the elections. On almost every level from official legislation through governmental practices, and social and cultural attitudes, Israel is only a democracy for one group, one ethnic group, that given the space that Israel now controls, is not even a majority group anymore, so I think that you’ll find it very hard to use any known definition of democracy which will be applicable for the Israeli case. ^ a b Gorenberg, Gershom. "Is Israel a Democracy?". The American Prospect. Retrieved 20 September 2014. Whether it ends the occupation and discrimination against Arab citizens within its borders will alter our perception of whether the nation began as an imperfect democracy or a false one. Today's political battles, strangely enough, will determine not only its future but also its past. ^ a b "Israeli-Occupied Territories". freedomhouse.org/. Freedom House. Retrieved 15 September 2014. ^ Bard, Mitchell (2008). Will Israel Survive. p. 1. Israel might be the only country in the world whose right to exist is debated and whose future is questioned. Can you imagine anyone asking whether the United States will survive or whether it should exist? Or anyone saying "no" if asked? ^ a b "Tel Aviv University, Israel Democracy Institute, Peace Index August 2010". Retrieved 2010-12-07. ^ a b "UN Resolutions between 2003 and today by country". Retrieved 2010-12-11. ^ a b Pappe, Ilan (1992). The Making of the Arab-Israeli Conflict 1947-1951, Chapter 9: The Lausanne Conference. I.B. Tauris. ISBN 1-85043-819-6. ^ Pappe, Ilan (2007). The ethnic cleansing of Palestine (New ed.). Oxford: Oneworld. ISBN 1851685553. ^ Morris, Benny (22 March 2004). "Politics by Other Means". The New Republic. Retrieved 17 May 2012. ^ Gutwein, Daniel (2003). "Left and Right Post-Zionism and the Privatization of Israeli Collective Memory". In Shapira, Anita; Penslar, Derek Jonathan. Israeli Historical Revisionism: From Left to Right. London: Frank Cass Publishers. pp. 16–8. ^ "The Liar as Hero". ^ Shavit, Ari. "Survival of the Fittest (an interview with Historian Benny Morris)". Haaretz, Magazine Section, 9 January 2004. Retrieved 2 February 2015. ^ Rory McCarthy (2009-03-07). "Israel annexing East Jerusalem, says EU". The Guardian. London. Retrieved 2009-03-08. ^ "Israel/Occupied Palestinian Territories: The conflict in Gaza: A briefing on applicable law, investigations and accountability". Amnesty International. 2009-01-19. Retrieved 2009-06-05. ^ Levs, Josh (2009-01-06). "Is Gaza 'occupied' territory?". CNN. Retrieved 2009-05-30. ^ Yakobson, Alexander (12 August 2014). "Try West Bank Settlers in Israeli Military Court - Just Like Palestinians". Haaretz. Retrieved 1 January 2016. ^ Shabi, Rachel (12 November 2012). "The Israeli documentary putting military rule in Palestine on trial". The Guardian. Retrieved 30 December 2015. ^ Peled, Miko (2012). The general's son : journey of an Israeli in Palestine. Charlottesville, Va.: Just World Books. ISBN 978-1935982159. ^ Burg, Avraham. "Israel's Fading Democracy". New York Times. Retrieved 29 September 2014. It will not be possible to define Israel as a democracy when a Jewish minority rules over a Palestinian majority between the Jordan River and the Mediterranean Sea — controlling millions of people without political rights or basic legal standing. ^ REMNICK, DAVID. "Threatened". The New Yorker. Retrieved 9 October 2014. “The dream of a Jewish and democratic state cannot be fulfilled with permanent occupation,” Obama has said. Netanyahu and many of his supporters believe otherwise; too often, they consider the tenets of liberal democracy to be negotiable in a game of coalition politics. ^ "paragraphs 95-101 and 120" (PDF). Archived from the original (PDF) on 2010-07-06. Retrieved 2011-01-13. ^ Zacharia, Janine (11 March 2010). "Biden's rebuke on new housing comes as Israel seeks to reaffirm U.S. relations" – via www.washingtonpost.com. ^ "Statement by EU High Representative Catherine Ashton on demolition and settlements in East Jerusalem (January 10, 2011)" (PDF). ^ Jarbawi, Ali. "Israel's Colonialism Must End". New York Times. Retrieved 11 November 2014. ^ "Hollow Land: Israel's Architecture of Occupation". Verso Books. Retrieved 11 November 2014. ^ Ravid, Barak; Khoury, Jack (31 July 2015). "EU, U.S. State Department Condemn 'Vicious' West Bank Arson Attack" – via Haaretz. ^ a b "Countries". amnesty.org. ^ "Israel's release of Palestinian political prisoners could boost peace prospects – Ban". 7 March 2011. ^ "Israeli Arabs More Likely to Be Convicted for Crimes Than Their Jewish Counterparts, Study Shows". 2 August 2011 – via Haaretz. ^ "Israel's rights groups condemn 'Jews only' businesses (The National, Aug 10, 2011)". ^ Ravid, Barak. "Merkel chides Netanyahu for failing to make 'a single step to advance peace'." Haaretz Newspaper, 25 February 2011. ^ Ravid, Barak. "Veteran Israeli diplomat: Netanyahu and Lieberman harming Israel's stance in international community." Haaretz Newspaper, 2 March 2011. ^ "Israel and the Occupied Territories Shielded from scrutiny: IDF violations in Jenin and Nablus". Amnesty International. 2002-11-04. Retrieved 2007-09-09. ^ Human Rights Watch, Jenin: IDF Military Operations, VII. Human Shielding and the Use of Civilians for Military Purposes, May 2002. ^ a b B'Tselem, "20 July 2006: Israeli Soldiers use civilians as Human Shields in Beit Hanun", July 20, 2006. ^ "Israel Probes "Human Shield" Allegations", CBS News, 11 April 2007. ^ "Q&A: Nuclear disarmament". 29 May 2010 – via news.bbc.co.uk. ^ a b "Chemical and Biological Weapons Status at a Glance - Arms Control Association". armscontrol.org. ^ AP. "Israeli Sees Chemical Option Against Iraqis". ^ ISRAEL AND THE OCCUPIED TERRITORIES: ISRAEL MUST PUT AN IMMEDIATE END TO THE POLICY AND PRACTICE OF ASSASSINATIONS (Amnesty, 3 July 2003) "Amnesty International calls for an immediate end to the policy and practice of assassinations. For many years the Israeli army and security services have pursued a policy of extrajudicially executing Palestinians, without offering any proof of guilt and no right of defence. The pursuit of this policy has also resulted in the unlawful killing of scores and injury of hundreds of bystanders, including children"
^ "Israel's 'assassination policy'". 1 August 2001 – via news.bbc.co.uk. ^ "Israeli soldier faces jail for passing secrets to reporter". ^ Valerie Zink (January 2009), "A quiet transfer: the Judaization of Jerusalem", Contemporary Arab Affairs, 2 (1): 122–133, doi:10.1080/17550910802576148 This definition is drawn largely from Valerie Zink's, and is supported, among others, by that of Hassassian in Ginat et al., who defines the Judaization of Jerusalem as "impos[ing] a Jewish landscape both physically and demographically." ^ "THE STATUS OF JERUSALEM (Chapter 12) (UN)" (PDF). ^ "Inter Press Service - News and Views from the Global South". ipsnews.net. ^ "Left-Wing US Jews Call 'Law of Return' Racist". Israel National News. ^ Omer-Man, Michael (7 August 2011). "This Week in History: Jewish right to aliya becomes law". The Jerusalem Post. Retrieved 30 December 2015. ^ "Israel 'infected by seeds of fascism' - ex-PM after Netanyahu's rightward shift". Russia Today. Retrieved 21 May 2016. ^ "Barak warns of 'fascism' in Israel's government; Livni sees an 'ethical crisis'". Times of Israel. Retrieved 21 May 2016. ^ "UN Watch Testifies Before U.S. Congress on "The State of Human Rights at the U.N."". ^ Settler policy imperils Israel’s foundations, Financial Times, Feb. 21st, 2013: "Faced with widely drawn international parallels between the West Bank and the Bantustans of apartheid South Africa, senior figures in Mr Netanyahu’s Likud party have begun to admit the danger." ^ McGreal, Chris (6 February 2006). "Worlds apart". the Guardian. ^ "Civil rights group claim Israeli occupation is "reminiscent of apartheid" (The Independent, Dec. 7, 2008)". ^ Ben, Michael (2010-05-11). "The war's seventh day – Haaretz Daily Newspaper | Israel News". Haaretz.com. Retrieved 2010-05-16. ^ אלוני, שולמית (31 December 2006). "אכן כן, אפרטהייד בישראל" – via Ynet. ^ "London protesters compare Gaza to Auschwitz outside Israeli Embassy". 12 July 2014. ^ "The Campus War Against Israel and the Jews: Joseph Massad - by DiscoverTheNetworks.org". 1 October 2009. ^ "The "Chosen People"". jewishvirtuallibrary.org. ^ Druks, Herbert, The Uncertain Alliance: The U.S. and Israel from Kennedy to the Peace Process, Greenwood Publishing Group, 2001, p.50. ^ Gordis, Daniel, Saving Israel: How the Jewish People Can Win a War That May Never End, John Wiley and Sons, 2010, p. 97. ^ Haaretz: "Prof. Yeshayahu Leibowitz's famous comment at the beginning of the First Lebanon War about "phenomena of Judeo-Nazism" as the inevitable consequences of an "occupation regime," stirred a furor in Israel. There are some things you must not say aloud, or even think to yourself. This was in 1982. The occupation was 15 years old and Leibowitz, in his sharp voice, was shouting what few others were saying here – if they did, it was in a whisper, and never, heaven forbid, in the army itself." ^ * Sandercock, Josie, Peace under fire: Israel/Palestine and the International Solidarity Movement, Verso, 2004, pp.209-231. ^ Une sale historie [Paris: Anne-Marie Metailie 2005] p.44, cited in Bruckner, p.71. ^ Vardi, Daphna (2009-01-16). "MP Kaufman likens Israelis to Nazis | Jewish Telegraphic Agency". Jta.org. Retrieved 2014-08-18. Peter Schmidt (April 29, 2009). "Head of Anti-Defamation League Urged Santa Barbara to Act Against Critic of Israel". The Chronicle of Higher Education. Dana L. Cloud (April 30, 2009). "The McCarthyism That Horowitz Built: The Cases of Margo Ramlal Nankoe, William Robinson, Nagesh Rao and Loretta Capeheart". CounterPunch. Archived from the original on May 29, 2010. Spencer, Robert and Geller, Pamela, The Post-American Presidency: The Obama Administration's War on America, Simon and Schuster, 2010, pp.97-98. "Jean Ziegler, the UN special rapporteur on the Right of Food, for example, called the Gaza Strip 'an immense concentration camp' and compared Israelis to Nazis." ^ Thorpe, Vanessa; Helmore, Edward (14 December 2013). "Former Pink Floyd frontman sparks fury by comparing Israelis to Nazis". The Guardian. Retrieved 1 April 2016. ^ Lis, Jonathan; Pulwer, Sharon (28 December 2015). "Justice Minister Shaked Is 'Neo-Nazi Scum,' Says Hebrew University Professor". Haaretz. Retrieved 30 December 2015. ^ McKernan, Bethan (24 July 2018). "'Spirit of Hitler' has emerged in Israel after new nation state law, says Turkey president Erdogan". The Independent. Retrieved 24 July 2018. ^ Zeffman, Henry (1 August 2018). "Hajo Meyer profile: Physicist who survived Auschwitz". The Times. Retrieved 11 September 2018. ^ "Working Definition of Antisemitism. European Forum on Antisemitism". European-forum-on-antisemitism.org. Retrieved 2014-08-18. ^ Hirsh, David. 2007. Anti-Zionism and Antisemitism: Cosmopolitan Reflections. Working Paper. Yale Initiative for the Interdisciplinary Study of Antisemitism (YIISA) Occasional Papers, New Haven, CT.
^ "Howard Jacobson: Let's see the 'criticism' of Israel for what it really is". The Independent. London. 18 February 2009. ^ "Jewish Voice for Labour offer new anti-Semitism definition". Jewish News. 17 May 2018. Retrieved 17 May 2018. ^ "Expelled activist tells JVL meeting that 'witchhunt' is plot to 'topple' Corbyn". Jewish News. 25 September 2018. Retrieved 1 November 2018. ^ Alvin H. Rosenfeld, "Rhetorical Violence and the Jews," The New Republic, February 27, 2007. ^ "US anti-Semitism envoy slams UN 'double standards' on Israel". ^ Neumann, Michael (2006). The Case Against Israel. ^ Ian Buruma (July 2010). "Is Israel a normal country?". Haaretz. Retrieved 9 December 2010. ^ Edward C. Corrigan (30 July 2010). "Israeli Criticism of Zionism and the Treatment of Palestinians: The Politicians". Retrieved 9 December 2010. ^ Stephen Shalom (19 November 2010). "Singling out Israel – the arguments revisited". Retrieved 9 December 2010. ^ Editorial Comment (17 May 2006). "Who's singling out Israel?". London: The Guardian. Retrieved 9 December 2010. ^ Richard Kuper (January 2006). "Singling out Israel". Red Pepper. Retrieved 9 December 2010. "ARE ANTI-ISRAELI AND ANTI-ZIONIST EXPRESSIONS ANTISEMITIC? If we turn to the crucial question of defining the point where anti-Israeli and anti-Zionist expressions are to be considered as antisemitism, then we could conclude, on the basis of our definition of antisemitism, that anti-Israeli or anti-Zionist attitudes and expression are antisemitic in those cases where Israel is seen as being a representative of “the Jew”, i.e. as a representative of the traits attributed to the antisemitic construction of “the Jew”. But what if the opposite is the case and Jews are perceived as representatives of Israel? What if Jews are criticised or offended for Israel’s policies toward the Palestinians? If we stick to our definition, then, strictly speaking, we would have to qualify hostility towards Jews as “Israelis” only then as antisemitic, if it is based on an underlying perception of Israel as “the Jew”. If this is not the case, then we would have to consider hostility towards Jews as “Israelis” as not antisemitic, because this hostility is not based on the antisemitic stereotyping of Jews... What should not be considered as antisemitic and therefore does not have to be monitored under the heading of “antisemitism”, is hostility towards Israel as “Israel”, i.e. as a country that is criticised for its concrete policies. Hostility towards Israel as “Israel” (as opposed to criticism of Israel as representative of the stereotypical “Jew”) should only then become a matter of general public concern, when there is explicit evidence that criticism of Israel as “Israel” produces attacks on Jews as either “the Jew” or “Israeli”. If there is no such evidence, the case of criticism and hostility towards Israel as “Israel” should not be part of monitoring activities under the heading of “antisemitism”. "[Senator Norm Coleman of Minnesota speaking] Natan Sharansky … has talked about three ways to determine whether criticism of Israel rises to the level of anti-Semitism. He talks about the three Ds" Demonization, double standards, and delegitimization. Demonization - when Israeli actions are blown so far out of proportion that the account paints Israel as the embodiment of all evil; Double Standards - when Israel is criticized soundly for thing any other government would be viewed as justified in doing, like protecting its citizens from terrorism. Delegitimization: a denial or Israel's right to exist or the right of the Jewish people to live securely in a homeland." Kamm quotes Eban: "There is no difference whatever between anti-Semitism and the denial of Israel's statehood. Classical anti-Semitism denies the equal right of Jews as citizens within society. Anti-Zionism denies the equal rights of the Jewish people its lawful sovereignty within the community of nations. The common principle in the two cases is discrimination". (New York Times, November 3, 1975). ^ a b "Working Definition of Antisemitism" (PDF). European Union Agency for Fundamental Rights. Archived from the original (PDF) on 5 January 2010. Retrieved 24 July 2010. Bechler, Rosemary (March 2007). "A Commentary on the All-Party Parliamentary Inquiry into Antisemitism" (MS Word). Faculty For Israeli-Palestinian Peace - UK. Retrieved 24 July 2010. "Playing the ‘Nazi card’ is a discursive act involving the use of Nazi or related terms or symbols (Nazism, Hitler, swastikas, etc.) in reference to Jews, Israel, Zionism or aspects of the Jewish experience. It manifests in words uttered in speech or in writing, or in visual representations such as artwork, drawings, caricatures, cartoons, graffiti, daubings and scratchings, or visual expressions such as a Nazi salute or the clicking of heels. In many instances, the playing of the Nazi card is unquestionably antisemitic. However, the inclusion of particular modes of criticism of Israel in definitions of antisemitism has provoked controversy. The result has been a war of words which has stagnated into an intellectual and discursive cul-de-sac of claim and counter-claim about what does and does not qualify as antisemitism…. One of the most challenging components of antisemitic discourse in general, and the discursive theme of the Nazi card in particular, concerns the problem of when the Nazi card is played against Israel and its founding movement, Zionism. In this case playing the Nazi card involves equating the Israeli state collectively, or the state embodied by its leaders or its military practices, with Nazis, Nazi Germany, and the genocidal actions of the Nazi regime…." "While much of the [report's] definition [of anti-Semitism relating to criticism of Israel] is unexceptionable, it cites five ways in which antisemitism could be seen to "manifest itself with regard to the state of Israel taking into account the overall context". One of these – "using the symbols and images associated with classic antisemitism... to characterize Israel or Israelis" – is fully justified. The other four are contentious: "Denying the Jewish people their right to self-determination"; "Applying double standards by requiring of [Israel] a behaviour not expected or demanded of any other democratic nation"; "Drawing comparisons of contemporary Israeli policy to that of the Nazis"; "Holding Jews collectively responsible for actions of the state of Israel". None of these four are self-evidently antisemitic. But all could be used to justify labeling legitimate criticism of Israel as antisemitic. So the authors' approval of them makes their claim that "Drawing attention to the consequent harms in [playing the Nazi card against Israel] should not be intended, or taken, in any way as an attempt to suppress criticism of Israel and its military practices" both naïve and flimsy." "The New York Times reported on January 31 [Patricia Cohen, "Essay Linking Liberal Jews and Anti_Semitism Sparks a Furor", 2007] about the most recent attempt by the American Jewish community to conflate intense criticism of Israel with anti-Semitism. In a neat little example of slippery slope, the report on 'Progressive Jewish Thought and the New Anti-Semitism,' written by Alvin H. Rosenfeld [and published by American Jewish Committee in 2006], moves from exposing the actual anti-Semitism of those who deny Israel's right to exist—and hence deny to the Jewish people the same right to national self-determination that they grant to every other people on the planet—to those who powerfully and consistently attack Israel's policies toward Palestinians, see Israel as racist the way that it treats Israeli-Arabs (or even Sephardic Jews), or who analogize Israel's policies to those of apartheid as instituted by South Africa." "… Schoenfeld takes umbrage at questions about the power of “the Jewish lobby,” and construes the asking of such questions as evidence of anti-Semitism. In some cases, he thinks that a particular criticism of Israel is overwrought, and takes its being overwrought as evidence of anti-Semitism. In some cases the claim is that a Jewish author is self-hating, which becomes evidence of anti-Semitism. In some cases we are told that a person draws attention to his Jewish friends while criticizing Israel, which only proves that the person wishes to be insulated from charges of anti-Semitism—which proves, in advance of any actual accusation, that he must be an anti-Semite.... The point is not that the charge of “anti-Semitism” should never be made: some people deserve it. Nor must it always be made with trepidation: some people obviously deserve it. Nor must anti-Zionists be thought immune to the charge: too many of them are guilty.... But the equation of anti-Semitism with anti-Zionism is a farce that has gone on long enough, and it’s time that those who saw through the farce said so—at length, if necessary....I’ve mentioned just a few examples here, but whatever its virtues (and there are some, as I’ve been at pains to suggest), the deficiencies I’ve described characterize the “new anti-Semitism” literature as a whole. For examples, consult Phyllis Chesler’s The New Anti-Semitism (pp. 4, 171-179, 182-185), Abraham Foxman’s Never Again: The Threat of the New Anti-Semitism (pp. 17-21), Alan Dershowitz’s The Case for Israel (p. 210), the writings of Bat Ye’or, as well as scattered essays in Rosenbaum’s anthology, Commentary, at WorldNet.Daily, or in your local Jewish paper. The modus operandi is more or less the same: First we are informed, accurately enough, of the existence of the new anti-Semitism. Then we are told that anti-Zionism is now ubiquitously used as a cover for that anti-Semitism. From there we skate imperceptibly to the equation of anti-Zionism with anti-Semitism. And from there we are blackmailed into accepting the equation on pain of being accused of anti-Semitism." "For a more profound explanation of Israeli's emerging opponents, the Zionist lobby blames 'new anti-Semitism'; a term nebulous and versatile enough to fit most any opponent. Arnold Foster and Benjamin Epstein define it as 'callous indifference to Jewish concerns, a failure to understand the most profound apprehension of Jewish people.' A 2007 British government investigation into racism counted 'perceptions of Anti-Semitism' as an example of it. Naturally such vagaries allow for almost indiscriminate accusations. Phyllis Chesler, author of A New Anti-Semitism casts her net wide to include as Israeli's enemies 'western-based international human rights organisations, western anti-capitalist, anti-globalist, pro-environment, anti-war and anti-racist activists, progressive feminists, Jewish feminists and the left and liberal American media'." "There is a long and ignoble history of "Zionist" being used as a code word for "Jew," as when Communist Poland carried out "anti-Zionist" purges in 1968, expelling thousands of Jews from the country, or when the extreme right today uses the acronym ZOG (Zionist Occupied Government) to refer to the US government. Moreover, the Zionist movement arose as a reaction to the persecution of Jews. Since anti-Zionism is the opposite of Zionism, and since Zionism is a form of opposition to anti-Semitism, it seems to follow that an anti-Zionist must be an anti-Semite. Nonetheless, the inference is invalid. To argue that hostility to Israel and hostility to Jews are one and the same thing is to conflate the Jewish state with the Jewish people. In fact, Israel is one thing, Jewry another. Accordingly, anti-Zionism is one thing, anti-Semitism another. They are separate. To say they are separate is not to say that they are never connected. But they are independent variables that can be connected in different ways." ^ Raab, Earl. "Antisemitism, anti-Israelism, anti-Americanism" Archived 2007-12-06 at the Wayback Machine, Judaism, Fall 2002. "These claims [that critics of Israel are anti-Semitic] are a textbook example of the fallacy of poisoning the well—the fallacy, in logic, of rebutting someone’s argument by adducing the ulterior motives he might have had for making it. Well poisoning is a ubiquitous feature of our misologistic culture, but Hanson’s commission of the fallacy differs from the run-of-the-mill variety by its subtle introduction of the issue of anti-Semitism. The claim here is not the truism that Arab anti-Semitism finds resonance in Europe, but that such interest as “the world” expresses in Palestine is merely a cover for its anti-Semitism. This claim is a casual instance of a broader trend: the reflexive equation, by defenders of Israel, of anti-Zionism with anti-Semitism, itself part of the emerging literature on “the new anti-Semitism.” Focusing on the undeniable fact that many anti-Zionists are anti-Semites, and that anti-Zionism can easily be used as a disguise for anti-Semitism, writers in this genre simply insist over and over that no one can be an anti-Zionist without simultaneously being an anti-Semite." Steven Zipperstein, argues that a belief in the State of Israel's responsibility for the Arab-Israeli conflict is considered "part of what a reasonably informed, progressive, decent person thinks." He argues that Jews have a tendency to see the State of Israel as a victim because they were very recently themselves "the quintessential victims." "To evade the obvious, another stratagem of the Israel's lobby is playing The Holocaust and 'new anti-Semitism' cards. In a previous study, I examined how the Nazi holocaust had been fashioned into an ideological weapon to immunize Israel from legitimate criticism. In this book I look at a variant of this Holocaust card, namely, the 'new anti-Semitism'. In fact, the allegation of a new anti-Semitism is neither new nor about anti-Semitism. Whenever Israel comes under renewed international pressure to withdraw from occupied territories, its apologists mount yet another meticulously orchestrated media extravaganza alleging that the world is awash in anti-Semitism. This shameless exploitation of anti-Semitism delegitimizes criticism of Israel, makes Jews rather than Palestinians the victims, and puts the onus on the Arab world to rid itself of anti-Semitism rather than on Israel to rid itself of the Occupied Territories. A close examination of what the Israel lobby tallies as anti-Semitism reveals three components: exaggeration and fabrication; mislabeling legitimate criticism of Israeli policy; and the unjustified yet predictable 'spillover' from criticism of Israel to Jews generally." "The dominant trope of the new 'new anti-Semitism' is that Israel has become the 'Jew among nations'…. In their 1982 study the Perlmuters pointed out the 'transformation … from anti-Semitism against Jews to anti-Semitism the object of which is the Jews' surrogate: Israel'… The transparent motive behind these assertions is to taint any criticism of Israel as motivated by anti-Semitism and - inverting reality - to turn Israel (and Jews), not Palestinians, in the victim of the 'current siege' (Chesler)." ^ Sander Gilman, "Jewish Self-Hatred: Anti-Semitism and the Hidden Language of the Jews," Baltimore:Johns Hopkins University Press 1986, pp. 361. "Yet there is nothing "new" about this or about this alleged anti-Semitism that these mainstream Jewish voices seek to reveal. From the moment I started Tikkun Magazine twenty years ago as "the liberal alternative to Commentary and the voices of Jewish conservatism and spiritual deadness in the organized Jewish community," our magazine has been attacked in much of the organized Jewish community as "self-hating Jews" (though our editorial advisory board contains some of the most creative Jewish theologians, rabbis, Israeli peace activist and committed fighters for social justice). The reason? We believe that Israeli policy toward Palestinians, manifested most dramatically in the Occupation of the West Bank for what will soon be forty years and in the refusal of Israel to take any moral responsibility for its part in the creation of the Arab refugee problem, is immoral, irrational, self-destructive, a violation of the highest values of the Jewish people, and a serious impediment to world peace." ^ Lerner: The impact of the silencing of debate about Israeli policy on Jewish life has been devastating. We at Tikkun are constantly encountering young Jews who say that they can no longer identify with their Jewishness, because they have been told that their own intuitive revulsion at watching the Israeli settlers, with IDF support, violate the human rights of Palestinian civilians in the West Bank, or their own questioning of Israel's right to occupy the West Bank, are proof that they are "self-hating Jews." The Jewish world is driving away its own young. "Anti-Semitism can be disguised as anti-Zionism, and a Jew can be an anti-Semite. In principle, therefore, exposing an alleged Jewish anti-Semite is legitimate. But if you read the growing literature that does this - in print, on Web sites and in blogs - you find that it exceeds all reason: The attacks are often vitriolic, ad hominem and indiscriminate. Aspersions are cast on the Jewishness of individuals whom the attacker cannot possibly know. The charge of Jewish "self-hatred" - another way of calling someone a Jewish anti-Semite - is used ever more frequently, despite mounting evidence that it's an entirely bogus concept. Anything from strong criticism of Israel's policies, through sympathetic critiques of Zionism, to advocacy of a one-state solution for the Israel-Palestine conflict, is defined as anti-Zionism, when none of these positions are prima facie anti-Zionist. Many attackers endow their targets with the ability to bring disaster and dissolution to the Jewish people, thereby making it a national and religious duty for Jews to wage a war of words against other Jews." "The equation 'anti-Zionism = anti-Semitism' has thus become the new orthodoxy, and has even earned the seal of approval of the European Union. Its racism and anti-Semitism monitoring center (the [Fundamental] Rights Agency) produced a 'working definition' of anti-Semitism, with examples of five ways in which anti-Israel or anti-Zionist rhetoric is anti-Semitic. The 2006 report of the U.K.'s All-Party Parliamentary Inquiry into Anti-Semitism urged the adoption of the EU definition, and the U.S. State Department's 2008 report 'Contemporary Global Anti-Semitism' is also based on it. The redefinition of anti-Semitism has led to a further radical change in confronting the phenomenon. Many Jews are at the forefront of the growing number of anti-Israel or anti-Zionist groups. So, perceived manifestations of the 'new anti-Semitism' increasingly result in Jews attacking other Jews for their alleged anti-Semitic anti-Zionism." "Several organisations such as the self-styled NGO Monitor, Israel Resource News Agency, WorldNetDaily and the Near and Middle East Policy Review are promoting the view that the work of Human Rights NGOs working in Israel is, by its very nature, anti-Israel. Their charge is to associate moral and ethical criticism of any activity by Israel or the policies of its Government as being anti-Israel, anti-Semitic and when conducted by Jews, as evidence of self-hatred." "We are appalled by recent attempts of prominent Jewish organizations and leading Canadian politicians to silence protest against the State of Israel. We are alarmed by the escalation of fear tactics. Charges that those organizing Israel Apartheid Week or supporting an academic boycott of Israel are anti-Semites promoting hatred bring the anti-Communist terror of the 1950s vividly to mind. We believe this serves to deflect attention from Israel’s flagrant violations of international humanitarian law…. We recognize that anti-Semitism is a reality in Canada as elsewhere, and we are fully committed to resisting any act of hatred against Jews. At the same time, we condemn false charges of anti-Semitism against student organizations, unions, and other groups and people exercising their democratic right to freedom of speech and association regarding legitimate criticism of the State of Israel." "But the most destructive impact of this new Jewish Political Correctness is on American foreign policy debates. We at Tikkun have been involved in trying to create a liberal alternative to AIPAC and the other Israel-can-do-no-wrong voices in American politics. When we talk to Congressional representatives who are liberal or even extremely progressive on every other issue, they tell us privately that they are afraid to speak out about the way Israeli policies are destructive to the best interests of the United States or the best interests of world peace—lest they too be labeled anti-Semitic and anti-Israel. If it can happen to Jimmy Carter, some of them told me recently, a man with impeccable moral credentials, then no one is really politically safe." ^ Lerner: "Even better if we could succeed in creating a powerful alternative to AIPAC. Unfortunately, that path is not so easy. When we approached some of the Israel peace groups to form an alliance with us to build the alternative to AIPAC we found that the hold of the Jewish Establishment was so powerful that it had managed to seep into the brains of people in organizations like Americans for Peace Now (not the Israeli group Peace Now which has been very courageous), Brit Tzedeck ve'Shalom and the Israel Policy Forum or the Religious Action Center of the Reform movement. As a result these peace voices are continually fearful that they will be "discredited" if they align with each other and with us to create this alternative to AIPAC. Meanwhile, while they look over their right shoulders fearfully, the very people that they fear will "discredit" them for aligning with each other and with us are already discrediting them as much as they possibly can." "In defense of her [Chesler's] assertion that there is a global "war against the Jews," Chesler wields the ultimate weapon. "In my opinion," she says, "anyone who denies that this is so or who blames the Jews for provoking the attacks is an anti-Semite." Since I deny that there is such a war, this makes me an anti-Semite. But since her argument empties the word of all meaning, I do not feel maligned. In his contribution to A New Antisemitism?, historian Peter Pulzer, faulting the way "the liberal press" sometimes reports the activities of the Israel Defense Forces in the occupied territories, makes a telling point about the misuse of words. He says: "When every civilian death is a war crime, that concept loses its significance. When every expulsion from a village is genocide, we no longer know how to recognize genocide. When Auschwitz is everywhere, it is nowhere." Point taken. But equally, when anti-Semitism is everywhere, it is nowhere. And when every anti-Zionist is an anti-Semite, we no longer know how to recognize the real thing--the concept of anti-Semitism loses its significance." ^ Handleman, Scott, "Trivializing Jew-Hatred," in The Politics of Anti-Semitism, ed. Alexander Cockburn. AK Press, 2003, p. 13. "a McCarthyite tendency to see anti-Semites under every bed, arguably contributes to the climate of hostility toward Jews. The result is to make matters worse for the very people these authors mean to defend." "In many parts of the world this is in danger of becoming a self-fulfilling assertion: Israel's reckless behavior and insistent identification of all criticism with anti-Semitism is now the leading source of anti-Jewish sentiment in Western Europe and much of Asia. But the traditional corollary - if anti-Jewish feeling is linked to dislike of Israel then right-thinking people should rush to Israel's defense - no longer applies. Instead, the ironies of the Zionist dream have come full circle: For tens of millions of people in the world today, Israel is indeed the state of all the Jews. And thus, reasonably enough, many observers believe that one way to take the sting out of rising anti-Semitism in the suburbs of Paris or the streets of Jakarta would be for Israel to give the Palestinians back their land." "When this bubble of repression of dialogue explodes into open resentment at the way Jewish Political correctness has been imposed, it may really yield a "new" anti-Semitism. To prevent that, the voices of dissent on Israeli policy must be given the same national exposure in the media and American politics that the voices of the Jewish establishment have been given.... We hope that the creation of our interfaith Network of Spiritual Progressives (NSP at spiritualprogressives.org) can provide a safe context for this kind of discussion among the many Christians, Muslims, Unitarians, Hindus, Buddhists and secular-but-not-religious people who share some of the criticisms of Israel and who will eventually try to challenge the kind of anti-Semitism that might be released against Jews once the resentment about Jewish Political Correctness on Israel does explode." "The Anti-Defamation League sponsored a conference on this same topic in San Francisco on January 28, conspicuously failing to invite Tikkun, Jewish Voices for Peace and Brit Tzedeck ve Shalom, the three major Jewish voices critiquing Israeli policy, yet also strong supporters of Israel's security. Meanwhile, the media has been abuzz with stories of Jews denouncing former President Jimmy Carter for his book Palestine: Peace or Apartheid. The same charges of anti-Semitism that have consistently been launched against anyone who criticizes Israeli policy is now being launched against the one American leader who managed to create a lasting (albeit cold) peace between Israel and a major Arab state (Egypt). Instead of seriously engaging with the issues raised (e.g. to what extent are Israel's current policies similar to those of apartheid and to what extent are they not? ), the Jewish establishment and media responds by attacking the people who raise these or any other critiques--shifting the discourse to the legitimacy of the messenger and thus avoiding the substance of the criticisms. Knowing this, many people become fearful that they too will be labeled "anti-Semitic" if they question the wisdom of Israeli policies or if they seek to organize politically to challenge those policies." "No one should ever confuse criticism of Israel or of Israeli policies with anti-Semitism. And no one should ever accuse mere critics of Israel with anti-Semitism. If criticism of Israel or Israeli policies constituted anti-Semitism then the highest concentration of anti-Semites would be in Israel, where everybody is a critic… The claim that critics of Israel are branded as anti-Semites is a straw man and a fabrication of Israel's enemies who seek to play the victim card. Yet this big lie persists. Susannah Heschel, a professor of Jewish studies at Dartmouth, has charged, 'We often hear that criticism of Israel is equivalent to anti-Semitism'. Michael Lerner, the editor of Tikkun, has made a similar charge. So has Noam Chomsky. More recently, a vocal professor at Harvard, Lorand Matory, has made this accusation…. Thomas Friedman of the New York Times [wrote]… 'Criticizing Israel is not anti-Semitism, and saying so is vile. But singling out Israel for opprobrium and international sanction - out of all proportion to any other party in the Middle East - is anti-Semitism, and no saying so is dishonest." ^ a b c d Stephen Zunes, The Israel Lobby: How Powerful is it Really? Archived May 16, 2006, at the Wayback Machine, Foreign Policy in Focus, May 16, 2006. Retrieved August 27, 2006. ^ Soros, George. "On Israel, America and AIPAC." New York Review of Books, April 12, 2007. ^ a b Foxman, Abraham. “The deadliest lies: the Israel lobby ....” Google Books. 20 July 2009. ^ Rosenblum, Jonathan. "Paper on ‘Israel Lobby’ Poses Threat." Jewish Journal. 27 April 2006. 20 July 2009. ^ a b Dershowitz, Alan. "The Big New Lie." Archived 2007-12-24 at the Wayback Machine Alan M. Dershowitz. 20 July 2009. ^ Finkelstein. This is a major theme of the book, but is especially discussed in the Introduction and chapter 1. ^ Sears, Alan and Rebick, Judy, "Memo to Minister Kenney: Criticism of Israel is not anti-Semitism", online: "Defenders of Israeli policy routinely attempt to direct our attention to abuses happening in other places and insist that a hidden agenda must underlie any focus on Israeli brutality in this unjust world. This argument would lead to paralysis in human rights activism by claiming that one must address all cases at once, or only the "worst" cases. Should we have told Rosa Parks, who refused to go the back of a segregated bus in Alabama in 1955, to quit whining as conditions were even worse in South Africa, or colonized Kenya, or for that matter for Palestinians in refugee camps? The deployment of anti-Semitism as an accusation to silence criticism of Israel is also a serious setback in genuine struggles against anti-Semitism and other forms of discrimination. It is based on a claim that the State of Israel is the single outcome of the history of the Jewish people, the final end of generations of diasporic existence. It attempts to make the Zionist project of a Jewish nation the only legitimate project for all Jews." They were writing regarding Israel Apartheid Week controversy described in Haaretz. ^ Beaumont, Peter, "The new anti-semitism? ", The Observer, February 17, 2002: "But the problem with all this talk of a 'new anti-Semitism' is that those who argue hardest for its inexorable rise are dangerously conflating two connected but critically separate phenomena. The monster that they have conjured from these parts is not only something that does not yet exist - and I say 'yet' with caution - but whose purported existence is being cynically manipulated by some in the Israeli government to try to silence debate about the policies of the Sharon government…. As data collected by the Stephen Roth Institute at Tel Aviv University, and other research, makes clear, the rise in anti-Semitism in Europe coincided with the beginning of al-Aqsa intifada - and Israel's heavy-handed response…. What they are talking about is the criticism in the media and political classes of Europe of the policies of Sharon. Israel's brutal response to the often equally reprehensible anti-Israeli Palestinian violence of the intifada has produced one of the most vigorous media critiques of Israel's policies in the European media in a generation. The reply to this criticism, say those most vocal in reporting the existence of the new anti-Semitism, particularly in the Israeli press, is devastating in its simplicity: criticise Israel, and you are an anti-Semite just as surely as if you were throwing paint at a synagogue in Paris." ^ Henri Picciotto. "On Criticism of Israel and Anti-Semitism". ^ Mearsheimer and Walt, p 190: "Supporters of Israel have a history of using fears of a "new antiSemitism" to shield Israel from criticism. In 1974, when Israel was under increasing pressure to withdraw from the lands it had conquered in 1967, Arnold Forster and Benjamin Epstein of the ADL published The New Anti-Semitism, which argued that anti-Semitism was on the rise and exemplified by the growing unwillingness of other societies to support Israel's actions. In the early 1980s, when the invasion of Lebanon and Israel's expanding settlements triggered additional criticisms, and when U.S. arms sales to its Arab allies were hotly contested, then ADL head Nathan Perlmutter and his wife, Ruth Ann Perlmutter, released The Real Anti-Semitism in America, which argued that anti-Semitism was on its way back, as shown by the pressure on Israel to make peace with the Arabs and by events like the sale of AWACS aircraft to Saudi Arabia. The Perlmutters also suggested that many "anti-Semitic" actions, which they define as acts not motivated by hostility to Jews, may nonetheless harm Jewish interests (and especially Israel's well-being), and could easily bring back genuine anti-Semitism. The troubling logic of this argument is revealed by the fact that there was little mention of anti-Semitism during the 1990s, when Israel was involved in the Oslo peace process. Indeed, one Israeli scholar wrote in 1995 that 'never before, at least since the time Christianity seized power over the Roman Empire, has anti-Semitism been less significant than at present'. Charges of anti-Semitism became widespread only in the spring of 2002, when Israel came under severe criticism around the world for its brutal behavior in the Occupied Territories. … Natan Sharansky, the former Soviet dissident who is now a prominent Israeli author and politician, declares, 'The new anti-Semitism appears in the guise of 'political criticism of Israel', consisting of a discriminating approach and double standard towards the state of the Jews, while questioning its right to exist.' The implication is that any one who criticizes Israel's actions … is opposed to its existence and is therefore hostile to Jews. But this is a bogus charge, because it conflates criticism of Israel's actions with the rejection of Israel's legitimacy." "The 'new anti-Semitism' is a spin-off of the Holocaust industry. Whenever Israel comes under international pressure to resolve its conflict with the Palestinians diplomatically or faces a public relations debacle, its apologists mount a campaign alleging that the world is awash in a new anti-Semitism. … the purpose of these periodic extravaganzas is not hard to find: on the one hand, the perpetrators are turned into the victims, putting the spotlight on the alleged suffering of Jews today and diverting it from the real suffering of Palestinians; on the other hand, they discredit all criticism of Israeli policy as motived by an irrational loathing of Jews." "Whenever Israel faces a public relations debacle such as the Intifada or international pressure to resolve the Israel-Palestine conflict, American Jewish organizations orchestrate this extravaganza called the 'new anti-Semitism.' The purpose is several-fold. First, it is to discredit any charges by claiming the person is an anti-Semite. It's to turn Jews into the victims, so that the victims are not the Palestinians any longer. As people like Abraham Foxman of the ADL put it, the Jews are being threatened by a new holocaust. It's a role reversal – the Jews are now the victims, not the Palestinians. So it serves the function of discrediting the people leveling the charge. It's no longer Israel that needs to leave the Occupied Territories; it's the Arabs who need to free themselves of the anti-Semitism." ^ "Divestment forum held at Harvard - News". 22 August 2009. Archived from the original on 22 August 2009. ^ "Summers Says British Boycott of Israeli Academics Is Intentionally 'Anti-Semitic'". ^ Quoted by Menachem Wecker, "In Defense of Self-Hating Jews", May 2007, Jewish Currents, online at . "There have long been efforts to identify anti-Semitism and anti-Zionism in an effort to exploit anti-racist sentiment for political ends; 'one of the chief tasks of any dialogue with the Gentile world is to prove that the distinction between anti-Semitism and anti-Zionism is not a distinction at all,' Israeli diplomat Abba Eban argued, in a typical expression of this intellectually and morally disreputable position (Eban, Congress Bi-Weekly, March 30, 1973). But that no longer suffices. It is now necessary to identify criticism of Israeli policies as anti-Semitism -- or in the case of Jews, as 'self-hatred,' so that all possible cases are covered." ^ Amy Goodman (21 October 2004). "On the State of the Nation, Iraq and the Election, Noam Chomsky". ^ Quoted by Oliver Kamm http://oliverkamm.typepad.com/blog/2005/02/chomsky_antisem.html "Chomsky, antisemitism and intellectual standards" "But note that by 2002, in his remarks to the Scottish Palestine Solidarity Campaign, Chomsky is giving a flatly different account of Eban’s argument. What Eban is saying in the genuine quotation is that the denial of Israel’s statehood is equivalent to antisemitism. This is not at all the same thing as claiming that criticism of Israeli policies is equivalent to antisemitism. Chomsky’s interpolation – “By anti-Zionism he meant criticisms of the current policies of the State of Israel” – is not remotely supportable from the quotation. Chomsky has doctored his source in order to set up a straw man." "Abraham Foxman, the director of the Anti-Defamation League (ADL), said using the dollar sign and the Star of David in sequence [during Water's performance] echoed the stereotype that Jews were avaricious. Referring to criticism Waters has previously made of Israel for its treatment of the Palestinians, Mr. Foxman said the musician should have 'chosen some other way to convey his political views without playing into and dredging up the worst age-old anti-Semitic stereotype about Jews and their supposed obsession with making money'. … [Waters replied:] 'If I don't respond [to the suggestion of antisemitism] people will see the story and will come to believe I'm anti-Semitic, and I'm not. Nothing could be further from the truth….' Waters has spoken against Israeli policies and accused the ADL of painting critics as anti-Semitic. 'It's a screen that they hide behind. I don't think they should be taken seriously on that. You can attack Israeli policy without being anti-Jewish,' he [Waters] said." " I've been very deeply distressed in my visit to the Holy Land; it reminded me so much of what happened to us black people in South Africa. I have seen the humiliation of the Palestinians at checkpoints and roadblocks, suffering like us when young white police officers prevented us from moving about.... But you know as well as I do that, somehow, the Israeli government is placed on a pedestal [in the US], and to criticise it is to be immediately dubbed anti-semitic, as if the Palestinians were not semitic. I am not even anti-white, despite the madness of that group. And how did it come about that Israel was collaborating with the apartheid government on security measures? People are scared in this country [the US], to say wrong is wrong because the Jewish lobby is powerful - very powerful." "In an interview in Witness in 2003, Father Prior said: “The God they portray looks to me to be a militaristic and xenophobic genocide who would not be even sufficiently moral to conform to the Fourth Geneva Convention. How, I constantly ask myself, are such people so unconcerned about others being kicked out of their homes, children being shot, people struggling for survival against very oppressive forces of occupation?” Needless to say, he was sometimes accused of being anti-Semitic. But he was careful to distinguish between anti-Zionism and anti-Semitism. He believed that Muslims, Jews and Christians could and should live in equality and harmony. In his last article, published in The Tablet shortly before his death, he warned that the Catholic-Jewish liaison committee’s decision to equate antiZionism with anti-Semitism was a grave mistake. He was convinced that Zionism flew in the face of the Hebrew Scriptures." ^ Livingstone, Ken (4 March 2005). "The Guardian, "This is about Israel, not anti-semitism"". London. Sheehan, Cindy, "The Audacity of Israel" on Cindy Sheehan's Soapbox online blog, June 4, 2010. "Since my son was killed in Iraq and I have come to prominence in the peace movement, the name I am called with the second highest frequency (behind “anti-American”) is “anti-Semitic." First of all, isn’t it interesting if one is anti-violence and pro-peace, that automatically makes one anti-American and anti-Semitic? That just tells us that violence and oppression are so inherently institutionalized in our cultures, that if one is against these things, that makes one against the entire culture, race or way of life. It should be fundamentally understood that criticism of Israel’s program of Palestinian pogrom and the US’s demented foreign policy is not to be construed as hatred of all Jews or all Americans." "… Mearsheimer and Walt were widely accused of anti-Semitism and responded forcefully that, in their opinion, such accusations were baseless and were being leveled purely in order to suppress legitimate criticism of Israel and its supporters…. [their] thesis includes as a subordinate contention the claim that the Israel lobby uses the accusation of anti-Semitism purely as a tool to suppress criticism of Israel. All talk of a 'new anti-Semitism' is asserted to be part of a deliberate strategy: 'Israel's advocates, when pressed to go beyond mere assertion, claim that there is a new anti-Semitism which they equate with criticism of Israel. In other words, criticise Israeli policy, and you are by definition an anti-semite'." Harrison is quoting from Mearsheimer and Walt's 2006 article "The Israel Lobby" published in London Review of Books, vol 28, no. 6, 23 March 2006. ^ BBC News (13 October 2006). "Rebuke for peer's Israel remarks". "Video of Speech by Jenny Tonge in Parliament". Dana Gloger (11 July 2008). "Board attacks Tonge's Israel lobby criticism". ^ "ADL commentary on Robinson". ^ Cohen, Jodi S. (2015-11-12). "University of Illinois OKs $875,000 settlement to end Steven Salaita dispute". chicagotribune.com. Retrieved 2018-07-16. ^ Dershowitz, Alan (2004). The case for Israel (Paperback ed.). Hoboken, N.J.: John Wiley & Sons. ISBN 978-0471679523. ^ "Israel's Irish embassy: UN would have made Hitler happy". "On October 16, 2004, President George W. Bush signed the Israel Lobby’s bill, the Global Anti-Semitism Review Act. This legislation requires the US Department of State to monitor anti-semitism world wide. To monitor anti-semitism, it has to be defined. What is the definition? Basically, as defined by the Israel Lobby and Abe Foxman, it boils down to any criticism of Israel or Jews. Rahm Israel Emanuel hasn’t been mopping floors at the White House. As soon as he gets the Hate Crimes Prevention Act of 2009 passed, it will become a crime for any American to tell the truth about Israel’s treatment of Palestinians and theft of their lands. It will be a crime for Christians to acknowledge the New Testament's account of Jews demanding the crucifixion of Jesus. It will be a crime to report the extraordinary influence of the Israel Lobby on the White House and Congress, such as the AIPAC-written resolutions praising Israel for its war crimes against the Palestinians in Gaza that were endorsed by 100 per cent of the US Senate and 99 per cent of the House of Representatives, while the rest of the world condemned Israel for its barbarity. It will be a crime to doubt the Holocaust. It will become a crime to note the disproportionate representation of Jews in the media, finance, and foreign policy. In other words, it means the end of free speech, free inquiry, and the First Amendment to the Constitution. Any facts or truths that cast aspersion upon Israel will simply be banned…. Criminalizing criticism of Israel destroys any hope of America having an independent foreign policy in the Middle East that serves American rather than Israeli interests. It eliminates any prospect of Americans escaping from their enculturation with Israeli propaganda. To keep American minds captive, the Lobby is working to ban as anti-semitic any truth or disagreeable fact that pertains to Israel. It is permissible to criticize every other country in the world, but it is anti-semitic to criticize Israel, and anti-semitism will soon be a universal hate-crime in the Western world. Most of Europe has already criminalized doubting the Holocaust. It is a crime even to confirm that it happened but to conclude that less than 6 million Jews were murdered." "Using Nazi analogies to criticise Israel and Zionism is offensive, but should it be banned, criminalized or branded as antisemitic? … The authors of a new report, Understanding and Addressing the "Nazi Card": Intervening Against Antisemitic Discourse, from the European Institute for the Study of Contemporary Antisemitism (EISCA), take a different line.... While the principle that freedom of speech is not absolute is accepted in English law, not all offensive speech is criminalized. So, merely showing that comparing Israeli behaviour to the Nazis is offensive is no reason to outlaw such discourse. The authors try to get round this by arguing that such comparisons are especially offensive to Jews, because of their history. They say: "Most people would accept that it's completely unacceptable to call a Jewish person a Nazi." The implication here – that it may, therefore, be acceptable in some circumstances to call a non-Jew a Nazi – is unfortunate to say the least. If one is against the use of Nazi comparisons in public debate, it's unacceptable to call anyone a Nazi. In which case, the argument of exceptional offensiveness for Jews doesn't hold.... The authors write: 'although the playing of the Nazi card is not always antisemitic, it unquestionably always harms'. As a result, where this occurs, it could already be defined as a criminal act, and if not, Iganski and Sweiry say, consideration should be given to changing the law so that it would be. In other words, if you said 'the way the IDF operated in Gaza was like the way the SS acted in Poland', and a Jew found this offensive, hurtful or harmful, you could, in theory, go to jail." ^ "Palestinian Civil Society Calls for Boycott, Divestment and Sanctions against Israel Until it Complies with International Law and Universal Principles of Human Rights". Palestine BDS Campaign. 9 July 2005.